The Big Muff Pi with Tone Wicker taps into the sonic power of the legendary Big Muff Pi, but creates tonal possibilities at the flick of a switch -- or two. Use the Wicker switch to open up three high-frequency filters for raspy, sustaining distortion with top-end bite, or flick on the Tone switch to bypass the tone control for unabated tonal slam. 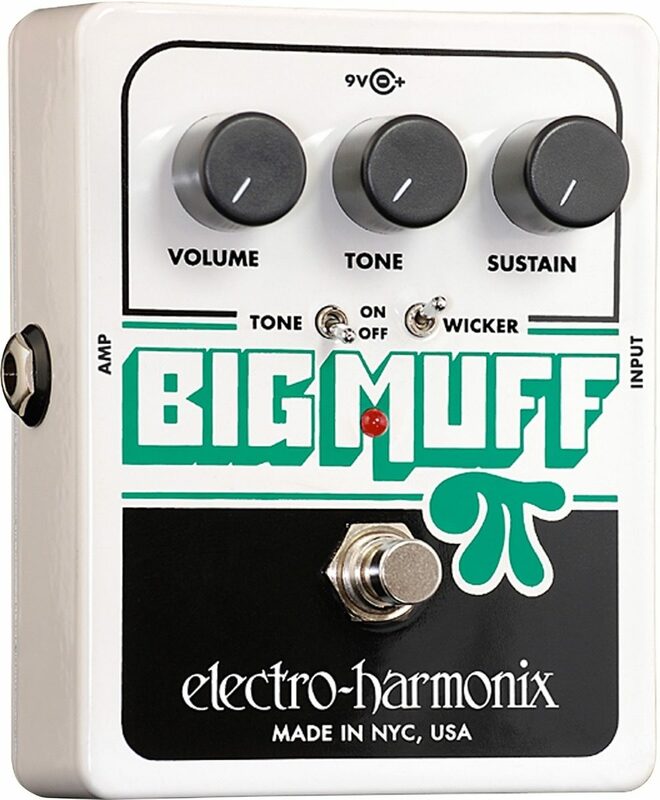 Want the original Big Muff sound? Just switch off the Wicker and turn on the Tone. The ability to create your own personal Big Muff sound is what truly makes this the Wicked Wicker. - The Tone switch completely removes the tone control, providing you with a devastating broadband Big Muff slam! This easily recognizable classic pedal has been heard on countless recordings from Pink Floyd, Jimi Hendrix, Carlos Santana, The Smashing Pumpkins, Frank Zappa, and a million others. This pedal is gritty and mean, and has insane amounts of bass on tap. It'll thicken up just about anything and is able to be used on bass effectively too. The added features include a "Tone" switch (which bypasses the tone control of the pedal) and a "Wicker" switch, which offers a nice boost in your top end tone and complements the lows nicely. Give this one a try if you are looking for a classic fuzzy distortion sound. "Great standard gets even better"
Sound: Every bit as good as the original, with some very useable, fuzzy alterations. Feature: Cool tweak to the original pi that gives some great variations on a proven classic Value: If you know the Big Muff pi you know it is one of the most useable musical and dial-able heavy fuzz with gorgeous sustain. It is just a fantastic fuzz/distortion for under 1 bill. This model is an even better value because it IS the original with a little more versatility. Can't get better fuzz for under 100. "Great fuzz for a great price"
Sound: Sounds like good ol' nasty fuzz. Maybe not as over the top as some other fuzz pedals but to my ear this pedal produces some very usable and likeable fuzz tones. I was actually surprised at the range of sounds this pedal could cover. 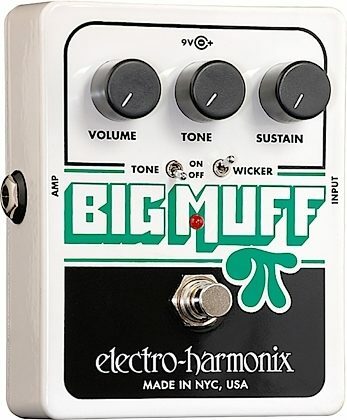 Feature: I bought this version over the standard big muff because of the additional tone options with the mini-toggle switches. I don't really use the wicker switch that much, but the tone bypass is pretty cool whether on or off. Also bought this one because it's about 1/3 the size of the regular. Ease of Use: I mostly just set it and forget it with this pedal. Real easy to dial in whatever style of fuzz you like and then just leave it alone. Very reliable. Quality: Seems to be built well enough. It's extremely light weight compared to my other pedals Value: For 90 bucks, this is a heck of a good buy. Nice, full sounding fuzz for less than $100 bucks. Heck, it's hard to find any good pedals for under $100. Overall: I'd buy this again if I had to. The Big Muff Tone Wicker has that great, classic fuzz feel to it, without the big price tag. Don't over-think this one, just get the pedal.